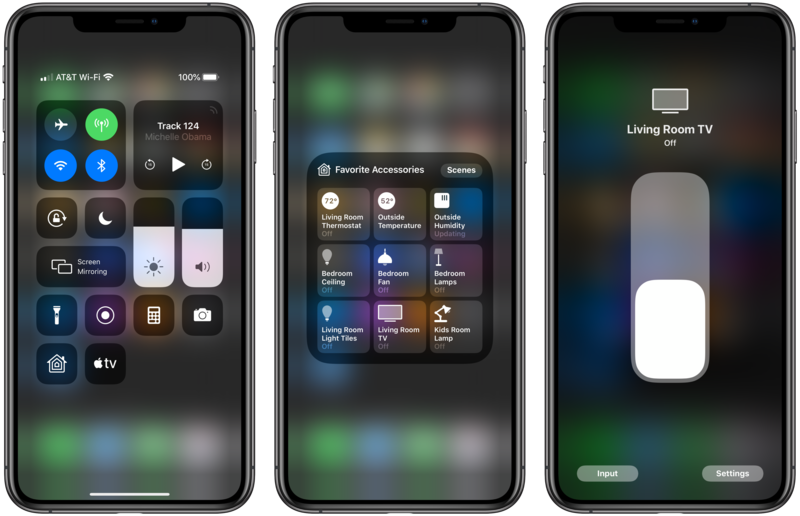 Apple released the first developer and public iOS 12.2 beta last week which introduces support for HomeKit TVs in the Home app, and HomeKit TV maker Vizio has opened a beta program for customers who want to test new features early. Developer Khaos Tian and the HomeBridge community have also made it possible to bring unofficial support to LG smart TVs running webOS, offering us a sneak peek at how HomeKit TVs will work with iOS and Siri (while also proving HomeKit support is possible on older LG TVs that won’t be officially supported). While this method doesn’t add AirPlay 2 to smart TVs, it does add some useful HomeKit features to smart TVs which can complement features that are part of Apple TV (including AirPlay 2). Starting with iOS 12.2, you can add HomeKit TVs to the Home app on iPhone and iPad. Once added to the Home app on iOS, the HomeKit TV will also appear on the Home app for the Mac. If favorited, your TV will also be included in the Home app on watchOS 5.2. And yes, Siri on the Apple TV can even turn your smart TV off if you ask the right way on tvOS 12.2. Apple TV 4 and Apple TV 4K already appear in the Home app and can serve as HomeKit hubs, but Apple TV doesn’t do much with HomeKit. tvOS 12.2 does enable new AirPlay 2 video features for Apple TV though. Specifically, you can tell Siri on an iPhone or iPad running iOS 12.2 to play a movie or TV show from your iTunes purchase history to play on a specific TV, then the video will begin playing on the Apple TV — totally hands-free. Siri on HomePod should work after a software update, but it has no beta program. You can also control playback from the iPhone or iPad Lock screen or Apple TV’s Now Playing tile when using this method. Unfortunately, you still can’t use an Apple TV to make your regular TV gain HomeKit features — even with HDMI-CEC. So what can TVs do with HomeKit? As we’ve seen, the answer is a lot! 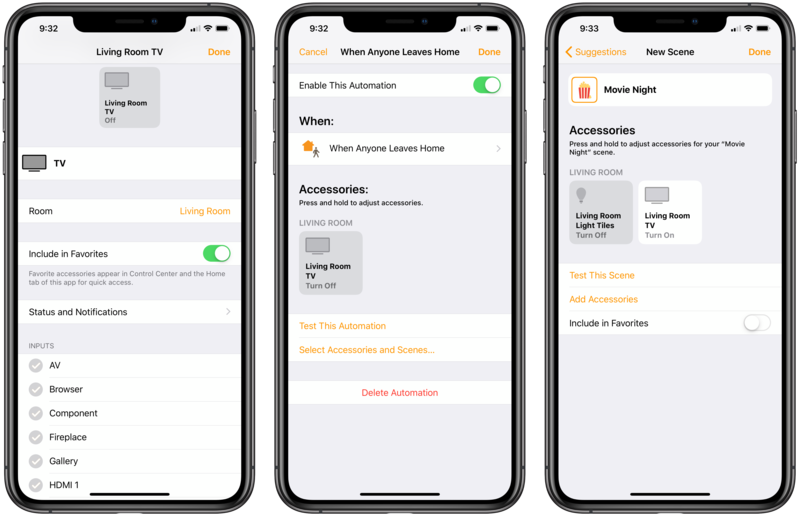 HomeKit TVs have basic on and off control, the ability to switch between TV inputs which you can name, and the option to include in scenes and automations with other accessories. You can even select which input the TV should use when controlled through a scene or automation. This means you could have a scene that sets your lights to one brightness level and color while turning your TV on to your game console input, while another set totally turns off your lights and turns your TV on to your Apple TV input for watching movies. Siri control for switching inputs outside of scenes is missing for now, but it seems like a feature we could easily see in the future. For now, Siri is limited to turning TVs on and off and activating pre-configured scenes that include HomeKit TVs. In terms of automation, you can build custom automations that fit your routine without manually toggling a status in the Home app or using Siri. For example, you can automatically turn your TV off when the last person leaves home so it’s never left on without someone watching, or you could automatically turn your TV off every night at 10 pm to remind yourself to go to bed. You can use view the Home app remotely to know if your TV is left on, which input it’s using, and remotely switch inputs or turn it off — something that could be useful for parents! Quick access to TV controls from Control Center on the iPhone and iPad is especially useful. Simply include your HomeKit TV as one of your first nine favorite accessories, and it will appear within the Home tile from Control Center. From here you have fast access to turning your TV on and off and switching between inputs. The Apple TV Remote tile has also been updated to work with HomeKit TVs. You’ve always been able to switch between Apple TVs, and now you can switch between HomeKit TVs as well. Navigation is different for HomeKit TVs, replacing a sliding gesture area with a virtual directional pad, but it works — you just need to pay more attention when navigating. While smart TVs that officially support HomeKit and AirPlay 2 will offer a smoother out-of-the-box set up experience, the HomeBridge method for LG smart TVs running webOS has its perks. For example, it’s possible to map specific LG webOS apps like the browser, third-party fireplace app, YouTube with 4K video, and Plex to inputs. Volume control also works using this method by using the physical volume buttons on the iPhone or iPad when in the TV Remote tile on Control Center, changing the volume level on my HDMI-connected Dolby Atmos sound bar. HomeKit and AirPlay 2 coming to smart TVs is exciting news. The features offered are genuinely useful and didn’t exist in the Apple ecosystem before. 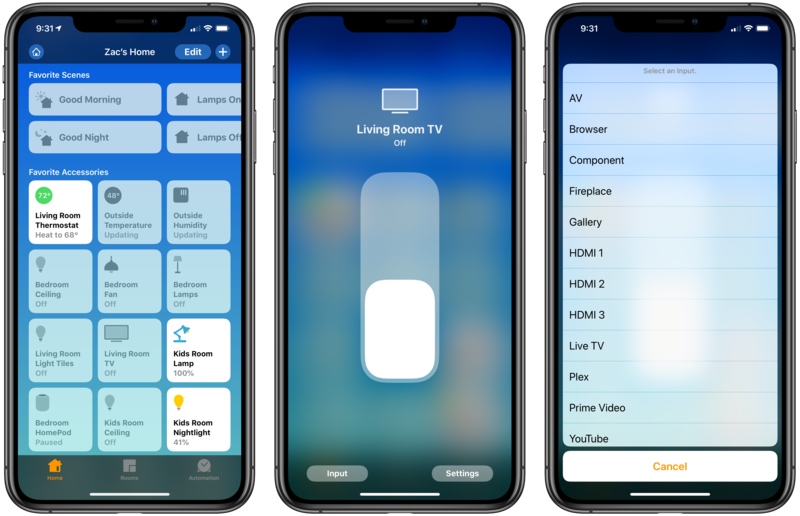 You could use complicated workarounds to make TVs work with HomeKit, but iOS 12.2 makes smart TVs first-class HomeKit accessories in the Home app. We still need to wait for iOS 12.2 to be finalized to know what might change between the beta period and final release, and HomeKit TVs are already being sold although official support will need to wait until Apple’s software is ready to go. But Vizio’s beta program and HomeBridge’s unofficial support is already giving us a great preview at what to expect! Personally, I also hope the Apple TV adopts some of the new features that are exclusive to HomeKit TVs for now, like the ability to be included with scenes and automation and control power which could work using HDMI-CEC (it already works with specific controls but not HomeKit). But HomeKit will definitely be a top feature worth considering the next time you’re in the market for a new TV, and it’s a great free feature if it’s coming to a smart TV you already own.